Pioneering Technology in Generating Monoclonal Antibodies. PurMabiologics has invented a technology to save and grow rare hybridomas, which are the most efficient antibody-producing cells. With traditional methodology, hybridomas would not be able to tolerate the long and harsh screening procedure. While traditional screening takes up to one month after fusion, our technology can screen the positive cells within minutes. Using our advanced technology, multiple fusions can be done simultaneously, producing a higher quality and quantity of antibodies. Using traditional methods, a team of at least 3-4 people must focus on only one fusion, as it is extremely confusing to deal with several fusions simultaneously. Therefore, with traditional methods, the number of generated antibodies in a certain amount of time is much lower. In traditional methodology, usually only a single antibody is generated against the protein of target. 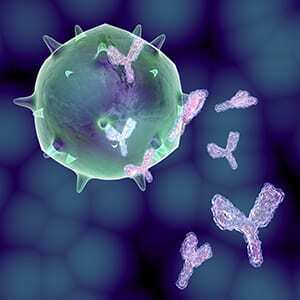 This antibody will be the strongest antibody that can tolerate the harsh screening conditions. Using our methodology, in each fusion several different antibodies are made against various epitopes, so there is a much higher chance to generate the particular and specific antibody that customers seek. In our technology, there is no need to use Hypoxanthine, Aminopterin, Thymidine (HAT). HAT is a chemical which currently used to eliminate the non-fused myeloma cells after fusion. This chemical, however, disables the salvage pathway, which is one of the two main routes by which hybridomas perform their DNA synthesis; these cells will solely rely on de novo pathways to perform DNA synthesis. If we start with about 25 million cells to perform the fusion, each of the 96-well chambers receive about 1500-2000 cells, most of which are eliminated by HAT soon after fusion. The dead bodies of the cells contaminate the environment and cause a “poisoning environment“ for APCs, which is inevitable using traditional methodology.